The State Department devoted itself to, in its own words, “deferring” U.N. action on Israeli war crimes, “reframing the debate” about the atrocities, and “moving away from the U.N.”, according to numerous emails from former Secretary of State Hillary Clinton. The messages, some of which are written by high-level State Department officials, expose the role of the U.S. government in undermining the international response to the 2009 United Nations Fact-Finding Mission on the Gaza Conflict, also known as the Goldstone Report -- which the U.S. admitted was only “moderate,” but still opposed. In this 2008-2009 campaign, dubbed Operation Cast Lead by the Israeli military, 1,391 Palestinians were killed, over half of whom were civilians, including 454 women and children, according to the Israeli Information Center for Human Rights in the Occupied Territories (also known as B'Tselem). Hundreds of Palestinian homes, hospitals, schools, businesses, and more were also destroyed in the attack. On the Israeli side, 10 soldiers were killed—four of whom died from friendly fire—along with three civilians. The disproportionate casualties led Palestinians to dub the conflict "the Gaza Massacre." The Goldstone Report accused Israel of numerous war crimes and violations of international humanitarian law. Israel committed “a grave breach" of the Fourth Geneva Convention in its intentional targeting of civilians, the U.N. report found. It also documented the Israeli military’s use of chemical weapons like white phosphorus on civilian areas, including hospitals. Palestinian militant groups were guilty of violating international law in their use of rockets, the report additionally noted. Throughout the long and delayed process in compiling the report, the U.S. and Israeli governments tried to stymie the investigation into atrocities committed by the Israel Defense Forces (IDF). The final report was released on September 15, 2009 at a massive 452 pages, yet even then was criticized by human rights activists for not being thorough enough in its documentation of what the U.N. characterized as Israeli war crimes. Publicly released Clinton emails reveal that the UNHRC, under heavy U.S. pressure, postponed consideration of the Goldstone Report from October 2 until March 2010. While the UNHRC ultimately endorsed the report’s findings on October 16, it took nearly six months for the body to urge the U.N. General Assembly and Security Council to refer the Gaza massacre to the ICC pursuant to 13(b) of the Rome Statute, which the U.S. then blocked. 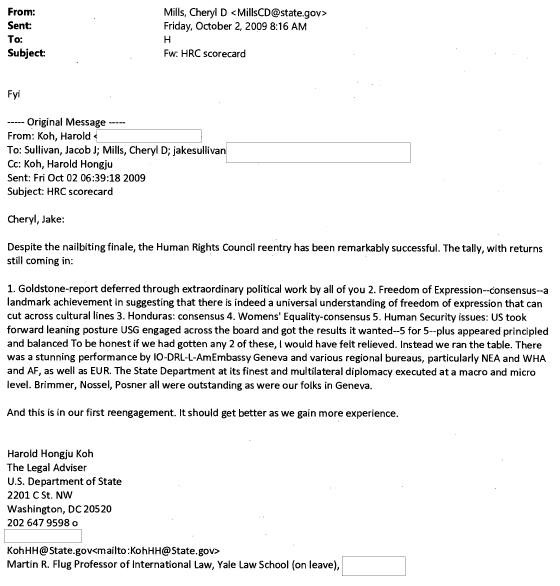 An email from Harold Koh — then Legal Adviser to the Department of State and leading defender of the Obama administration’s predator drone program, now a professor of international law at Yale University, where he previously served as dean of the law school, who also previously taught international law at New York University — demonstrates that the U.S. State Department self-consciously and successfully obstructed endorsement of the Goldstone Report by the UNHRC. Koh boasted that the Clinton camp “ran the table” in the UNHRC, with a “stunning performance” from various governmental organizations. Undermining the release of the U.N. fact-finding mission shows the “State Department at its finest,” he exulted. "Our approach has been to offer our support and willingness to work with the Government of Israel to reframe the public debate from defensive (responding to Goldstone or Flotilla reports and resolutions at the UN, etc.) to a more pro-active narrative focused on the challenges of fighting an urban or asymmetrical war. We are having productive, and generally positive preliminary conversations about a possible GOI white paper that would: 1) set the context, outlining the challenges in fighting an asymmetrical conflict; 2) spell out the steps the IDF and other agencies have taken to address these challenges; and 3) identify ongoing challenges that Israel and other professional armies will need to address in the future." “Our friends in the Pacific have lost their votes for the time being because of non-payment of dues,” Smith adds in a parenthetical, referring to the Pacific island nations that are often the only other countries in the world aside from the U.S. to vote against U.N. measures calling for action on Israeli war crimes. Internal communication like this demonstrates that what U.S. government officials admit among themselves differs greatly from what they say publicly. This finding corroborates what WikiLeaks exposes in its book The WikiLeaks Files. Scholars Stephen Zunes and Peter Certo, who penned the book’s chapter on Israel, note that "while public statements from the Obama administration frequently blamed 'both sides' for the failure of the peace process, the cables appear to indicate a growing consensus in private that the bulk of the blame lay on the Israeli side." A partially redacted email from Michael Posner to State Department officials furthermore reveals that Suzanne Nossel — who previously worked at the U.S. Mission to the U.N. and served as the former executive director of Amnesty International USA — and Posner “had a very construtive [sic] and frank discussion with Richard Goldstone” himself on October 23, 2009. What exactly they said in their discussion is redacted, but Posner states "we did outline our concerns about the report to him and our concerns about the UN process." Nossel's career reflects the revolving door between the U.S. State Department and human rights organizations. As a former deputy assistant secretary of state, Nossel proclaimed in a speech at the conservative Heritage Foundation think tank in 2011, "At the top of our list is our defense of Israel, and Israel’s right to fair treatment at the Human Rights Council." "We have been very consistent in standing up and calling votes on resolutions that are biased or one-sided or non-constructive. We will do that even if we are the only one voting against; we don’t hesitate," Nossel continued. "We have also worked quietly behind the scenes to try to moderate the resolutions that have passed, and we have seen a little bit of progress in that regard," she added. In a 2003 scholarly article titled "Battle Hymn of the Democrats," Nossel declared that "Democrats must be seen to be every bit as tough-minded as their opponents. Democratic reinvention as a 'peace party' is a political dead end." Consistent with this view, in an article in the National Interest in 2003, Nossel implied support for the illegal U.S. war in Iraq, yet argued it should have been postponed several months. She also penned an article in the Huffington Post in 2006 raising the possibility of a preemptive war against Iran. Under the leadership of Nossel, Amnesty International-USA came under fire from anti-war groups like CODEPINK for creating ads featuring the words "NATO: Keep the progress going" superimposed over Afghan women in burqas. In a 2012 Wellesley College discussion with former Secretary of State Madeleine Albright and World Bank President James Wolfensohn, Nossel also spoke positively of the 2011 NATO bombing of Libya, and lamented that there was "a continued impasse" in the Security Council that prevented similar "forceful action" against Syria. Relaying his conversation with Nossel and Goldstone in the email, Posner adds, "We also talked about next steps, focused on moving away from the UN and more toward appropriate responses by each of the parties." Here, Posner seems to suggest that the U.S. did not want the U.N. to take punitive action against Israel for its documented war crimes in Gaza; instead, he suggests dealing with “the parties” separately, not with the input of the international community. Prominent legal and human rights organizations condemned the U.S. government for its attempts to push back against the U.N. report and for its refusal to let the Security Council take punitive action against Israel. “That President Obama is receiving the Nobel Peace prize after his failure to speak out during the Gaza war, and after his administration’s protection of a state that has committed war crimes, is an abomination,” then President of the Center for Constitutional Rights Michael Ratner remarked at the time. “Sadly, [the U.S.’s] conduct at the Human Rights Council where it called the Goldstone report deeply flawed shows that it will again do all in its power to try and bury any investigation of Israel for war crimes,” Ratner further explained. On November 4, Hillary Clinton published an article in The Forward, boasting "I defended Israel from isolation and attacks at the United Nations and other international settings, including opposing the biased Goldstone report." The emails analyzed above expose how exactly she did so. While progressives largely applauded the Obama administration’s accession to the UNHRC as an ostensible reversal of Bush-era exceptionalism, the State Department’s celebratory and denunciatory emails demonstrate a commitment to undermining the work of the U.N. and the international community as a whole at every turn. Jared Flanery is an historian and writer. He is a graduate student at Columbia University and the London School of Economics. He can be contacted at jmf2235@columbia.edu and found on Twitter at @Flaneury.